You've likely had eggnog at Christmas as a child, but consider making an adult version by concocting some alcoholic eggnog. This sweet beverage is made with milk or cream, eggs and spices. You can purchase pre-made versions in the dairy section, but it's fairly easy to make this drink on your own. First, gather the ingredients you need to make alcoholic eggnog, many of which you might already have in your kitchen. In a large pan, whisk together the eggs and yolks along with the sugar and salt until they are thoroughly blended together. Next, add the milk while continuing to whisk the mixture. Move the pan onto the stove with the lowest heat setting possible. Continue to stir until the mixture thickens up enough to coat the back of a spoon and/or reaches 160 degrees Fahrenheit. At that point, remove it from the heat and, if necessary, strain it using a fine mesh strainer or cheesecloth to remove any bits of cooked egg. Next, stir in the following ingredients: nutmeg, liquor and vanilla. Now you're all set until it's time to serve. Store the mixture in a clean and covered container in the refrigerator for at least four hours and up to three days. When you are ready to serve the alcoholic eggnog, whip up the cream and fold it into the mixture. Pour it into a chilled glass and enjoy! You'll have approximately 14 servings. Pour a little meringue in the bottom of the glass before serving. Swirl some whipped cream on top. Grate or curl chocolate on the surface of the eggnog. Add a cinnamon stick to the glass; this is always a festive addition. Substitute soy or rice-based milk if you have allergies or you're vegan. Eggnog contains raw eggs, so it presents a small risk for food poisoning from salmonella or other bacteria. You can greatly lessen this already small chance by using fresh and properly refrigerated, high quality eggs and cracking them carefully to avoid contact between the interior of the egg and its shell, where contamination usually occurs. If you are really concerned, follow a recipe that involves cooking the eggs slightly to kill any bacteria, or use a pasteurized egg mixture instead of fresh eggs. Keep in mind that the alcohol added to the eggnog actually helps make it safer! The typical cup of spiked eggnog contains around 400 calories and over 13 grams of fat. It isn't exactly a diet-friendly cocktail. 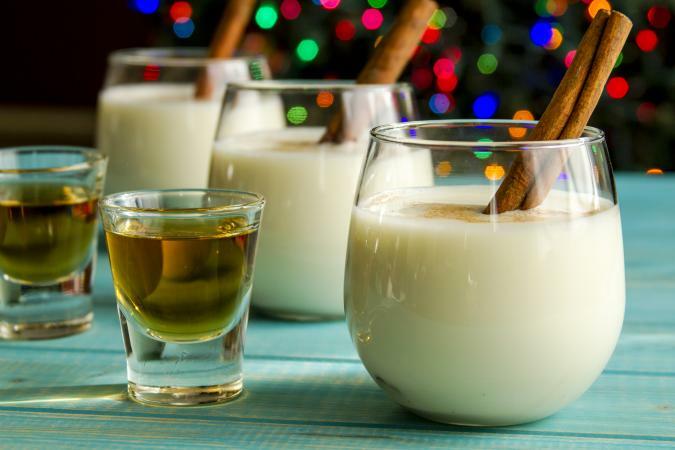 There are many other cocktail options that help you save on calories, but you can lighten the traditional eggnog recipe a little. Use skim or low-fat milk, for example, but don't expect it to taste as rich and creamy. Forgo the heavy cream and any additional rich toppings like ice cream. Compensate by adding extra spices, which are calorie free. Sugar-free instant pudding mix will help thicken and sweeten the mixture without adding many calories. Alcoholic eggnog makes the perfect holiday party drink, and you'll impress your guests that you didn't pour it directly from the carton. Of course, that is a viable option when you are pressed for time. Simply add some liquor and grate some fresh nutmeg on top, and no one will be the wiser.